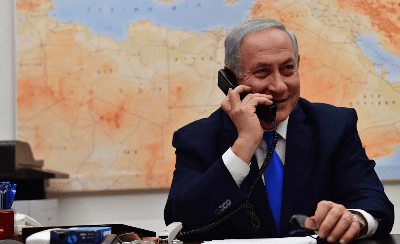 Israeli Prime Minister Benjamin Netanyahu speaking to U.S. President Donald Trump over the phone on March 21, 2019, thanking him for calling for the U.S. to recognize Israel’s sovereignty over the Golan Heights. Credit: Kobi Gideon/GPO. Adding to what has been deemed by many as a pro-Israel agenda by the Trump administration that also included recognizing Jerusalem as Israel’s capital and moving the U.S. embassy there, Thursday’s announcement comes as Israeli Prime Minister Benjamin Netanyahu is facing a close re-election battle on April 9. The move by Trump will likely been seen as a boost to Netanyahu that could be further bolstered by a visit to Washington next week, where he is scheduled to meet with Trump at the White House and address the annual AIPAC Policy Conference. Over the phone, Netanyahu told Trump, “You made history,” according to the prime minister’s office. Towards the end of the 1967 Six-Day War, Israel captured the Golan from the attacking Syrian army. In 1981, Israel’s Knesset voted to apply Israeli law to the Golan Heights, but stopped short of formally annexing it. After 1967 and for the next 40 years, multiple attempts by a number of Israeli prime ministers to give the Golan Heights to Syria in exchange for peace ended in failure over Syrian refusal to cut ties with terror organizations and Iran. Today the Golan Heights remains an critically important region for Israel’s security amid the Syrian civil war. Iran, which has deepened its presence in Syria during the war, and its terror proxies such as Hezbollah poses a serious threat to Israel from Syria. “There is no construct I can imagine now or any time in the future for the state of Israel to give the Golan up,” Sen. Lindsay Graham (R-S.C.) said during a recent visit to the region. Trump’s announcement was met with widespread praise by the pro-Israel community and supporters. “Given current political and security circumstances in Syria, we have said it was inconceivable to imagine Israeli withdrawal from the Golan Heights. @realDonaldTrump’s statement marks a dramatic change in American policy, and we appreciate his leadership on this issue,” tweeted AIPAC. Given current political and security circumstances in Syria, we have said it was inconceivable to imagine Israeli withdrawal from the Golan Heights. @realDonaldTrump‘s statement marks a dramatic change in American policy, and we appreciate his leadership on this issue. “I applaud @realDonaldTrump for taking the long overdue step of recognizing Israel’s sovereignty over the Golan Heights. It’s an enormously important signal that we stand with our allies and against our enemies, and will be heard by both,” tweeted Sen. Ted Cruz (R-Texas). “Yes. 100% right & a position I’ve long held as well after visiting the Golan Heights. Add this to the Embassy move to Jerusalem, signing the Taylor Force Act into law, fighting against anti-Israel & anti-Semitic hate at the UN & elsewhere, & withdrawing from the flawed Iran deal!,” he tweeted. However, J Street condemned Trump’s tweet. It’s clear that this cynical move by Trump is not about the long-term interests of the US or Israel, but rather about handing yet another political gift to Prime Minister Netanyahu in the hopes of boosting his chances for re-election next month. Once again, this administration is playing dangerous partisan games with US foreign policy and the US-Israel relationship.